In May 1992, Pittsburgh's two daily newspapers at the time—the Press and the Post-Gazette—went on strike. The walkout left the city without a paper of record for eight months, an unremarkable footnote of Yinzer history that happened to coincide with a most remarkable moment for the city's sports teams. On June 1, the Penguins would repeat as Stanley Cup champions by completing a four-game sweep of the Blackhawks in Chicago. In September, the Steelers would start their first season since 1968 without a head coach named Chuck Noll. Noll's replacement, a 35-year-old local guy with a square jaw named Bill Cowher, was as energetic as Noll was stoic. He called for a fake punt in the season opener and won the city over for good. But a bigger sensation arrived in Pittsburgh that summer. Tim Wakefield, who retired today after 19 Major League seasons, will be remembered primarily for his time in Boston. It was there that he earned two World Series rings and all but 14 of his 200 lifetime wins, and it was there that he became a sort of civic monument, another triumph of Beantown adaptive reuse to stand alongside Faneuil Hall. Strange though it now seems, it's impossible to overstate the Tim Wakefield phenomenon in Pittsburgh in the summer of 1992. It was a generation ago, and given the unrelenting futility the Pirates have endured ever since, not to mention the lack of a local newspaper record and Wakefield's own sudden freefall a short time later, it's almost impossible to believe it ever happened. It's as if history itself threw us a knuckleball. Wakefield made his debut July 31. He was called up from Triple-A Buffalo because Zane Smith was nursing an injured shoulder. Smith had been a crucial trade-deadline acquisition two years earlier, which is worth mentioning if only to remind people there used to be a time when the Pirates made trade-deadline acquisitions that didn't involve the likes of Matt Morris. Wakefield struck out 10 in his first outing, earning a complete-game victory. The Pirates had entered that night tied for first place with the Montreal Expos. Wakefield would go 8-1 with a 2.15 ERA in the season's final two months, throwing 92 innings and giving up only 76 hits and three home runs. The Bucs wound up winning the division—their third title in a row—by nine games. And Wakefield would become a star. Within weeks, the national media had just the story they wanted. Wakefield was a genuine curiosity. In 1989, he was a weak-hitting minor-league first baseman on the verge of being released. He began pitching after fooling around with a knuckleball one day and drawing the attention of his manager. The knuckleball had had its practitioners—the Niekro brothers, Charlie Hough, Tom Candiotti—but none of them burst on the scene the way Wakefield did in '92. Suddenly, the pitch was all the rage. Newspapers taught their readers how to throw a knuckleball. They described what it did, what it was like to try to hit it. Sid Bream, the former Pirates first baseman who would cross home plate for the Braves in Game 7 of the NLCS two months later, launching professional baseball in Pittsburgh into two decades of mediocrity, offered what remains the most memorable explanation of all: "Imagine being on a trampoline," Bream told an AP reporter at the time, "and trying to catch the ball while you're jumping up and down. That's what it's like with a good knuckleball." Wakefield was everywhere. A radio station came up with a song on its morning show. I don't remember the melody or any of the instrumentation, but the refrain involved somebody shouting "Knuckleball Wakefield!" over and over. Before long, the damn song was in constant rotation. The hype was relentless. On Aug. 31, The New York Times quoted then-Pirates manager Jim Leyland with this: "They have him in the Hall of Fame already, and that's ridiculous." It didn't stop in the postseason, either. The Pirates lost the first two games of the NLCS in Atlanta, but Wakefield came to the rescue in Game 3 with a complete game in which he limited the Braves to five hits. 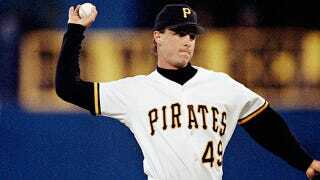 The Bucs were in a 3-2 series hole heading back to Atlanta for Game 6, but Wakefield bested Tom Glavine again with another complete game, this one aided by an eight-run second inning that began with Barry Bonds's only home run in three postseason series as a Pirate. Bonds's last game with the franchise was the next night, Oct. 14, and the details aren't worth rehashing here, except to note the following: As a knuckleballer, Wakefield could have pitched again. There are some who will always wonder why Leyland stuck with Stan Belinda even as Belinda so agonizingly combusted in that awful ninth inning of Game 7. Never mind that Wakefield was a starter, and Belinda was the team's closer. The Pirates have been looking up at .500 in every season since; some complaints don't need actual reason to seem reasonable. "The city of Pittsburgh means a lot to me and I wanted to finish my career there," Wakefield said, his eyes reddening. "The Pirates gave me every opportunity to prove myself these last years and I didn't produce." Six days later, on April 26, 1995, the Boston Red Sox signed Tim Wakefield to a minor-league contract.